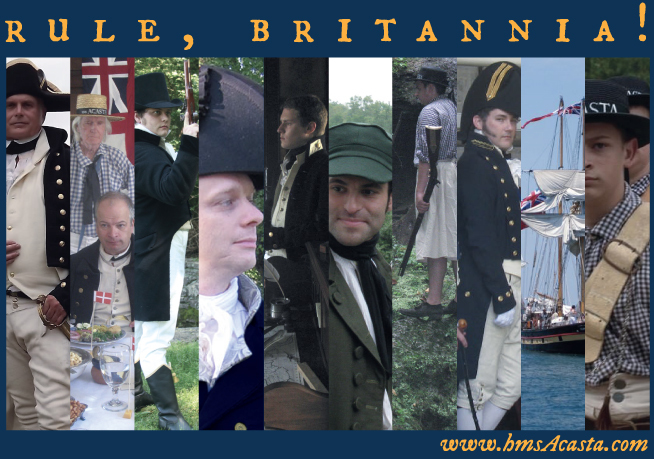 HMS Acasta: Happy New Year, 1813! Above is an artistic piece designed specifically to promote the HMS Acasta group and website. It features (from Left to Right) Capt. Robt. Freymann, 1st Lt. J. Hamilton waited on by honorary Acasta D. McArdle, 2nd Lt. M. Ramsey, Midshipman D. Raley, Purser B. Cushing, Able Seaman Mr. Houston, Acasta Surgeon Doctor Roberts, Able Seaman Mr. Alexander. You may feel free to make use of this piece so long as you do not remove the 'HMS Acasta' website address, or alter the images in any way. Also, having the picture LINK back to www.hmsacasta.com would be greatly appreciated. If you enjoy reading the adventures of the HMS Acasta, be certain to become an honorary member of the crew. This is a easy way to show us that you're out there and paying attention. It is a simple matter really, there is a blue button along the right side of this very page that will allow you to join. And Second, I would ask that you comment from time to time on the posts that interest you the most. This is an excellent way to let the crew of the Acasta know what you, the reader, is the most interested in seeing. It is always most gratifying to know what the readers like. Don't be content to LURK... participate! HOW can you participate you ask? Great question... read on! If you're a historical reenactor with an interest in the Royal Navy circa 1800-1812, you might be just the person we're looking for! Find out more about joining the Acasta HERE. OR, if you like to write, you can participate in our MAIL PACKET project, wherein you write a period style letter to one of the crew and it gets published AND answered here on the Acasta site. Be sure to click on the link for more details and EXAMPLES of some of the letters we've gotten thus far. The Acasta log is generally updated every weekday at 8am CST, visit back often, and tell your History/Royal Navy friends to visit us. Thanks for reading, and here's to the health of you and yours, and a happy new year! Happy New Year to you, Sir, and the rest of the crew!